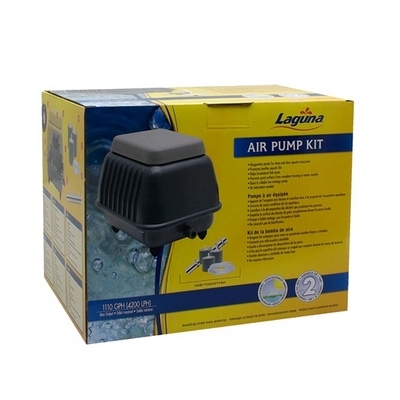 The NEW Laguna Air Pump Kit provides a variety of very practical benefits for ponds with fish all year round. In summer, pumping oxygen into your fish pond is crucial for their health, particularly in an over populated pond and during very hot periods when oxygen levels decline. Fresh oxygen contributes to a clean and clear aquatic ecosystem, promotes healthy aquatic life, and helps break down fish waste. In winter, air circulation generated by the pump prevents pond surfaces from completely freezing, allowing fresh oxygen to enter the water and toxic gases to escape. This gas exchange is vital for the survival of hibernating fish. 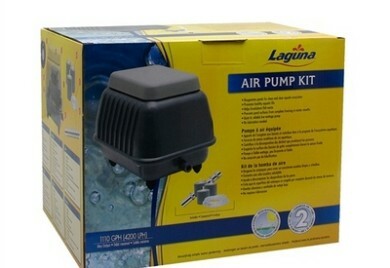 The low-wattage pump generates powerful and continuous air circulation quietly and energy-efficiently. The pump requires no lubrication and is certified for outdoor use. Available in two sizes for ponds up to 7000 gallons. 2 year manufacturer warranty. Extra long 32&apos; power cord. Super energy effecient, rated at 35w or 50w. Each kit includes, air pump, individual adjusting chrome manifold, tubing and air stones. Additional stones and tubing can be purchased separately.